Superpave Gyratory Compactor - Gilson Co.
HM-685 Superpave Gyratory Compactor by Pine Instruments prepares hot-mix asphalt specimens for Superpave mix design operations, and is made in the USA. A mold with asphalt specimen is gyrated on its longitudinal axis at a fixed angle while the end platens are held parallel. Mold Assemblies are sold separately. The HM-685 models also test a wide range of materials including soils, emulsion-based mixes, and roller compacted concrete. Variable user settings regulate compaction pressure, angle adjustment, gyrations, and adaptability for different size molds, enabling versatility in a variety of applications. An integrated computer with two USB ports and an Ethernet jack manages settings through a simple menu interface, and a four-button control panel simplifies machine operation. The computer also sets the angle of gyration and allows the user to switch between internal and external angle settings with little effort. The control system is network compatible for complete data management. Number and angle of gyrations, specimen height, and consolidation pressure can be sent through an Ethernet cable to a network or to a standalone PC, stored on a flash drive, or printed directly with the optional HMA-626 PCL Laser Printer. Operation modes can be set to a specified number of gyrations, specified sample height, or a locking point, all at a selected internal or external angle. Total gyrations can be selected from 0 to 999 at 30 ±0.5 gyrations per minute and 0° to 1.50° internal or external angle, with compaction pressure selectable from 200 to 999 kPa. Final specimen height is user-controlled from 0 to 200mm. A built-in specimen extruder and a completely enclosed compacting chamber are convenience and safety features, minimizing lifting of hot, heavy molds, and shielding moving parts. Molds are available for 150mm, 100mm, or 4.0in diameter specimens. 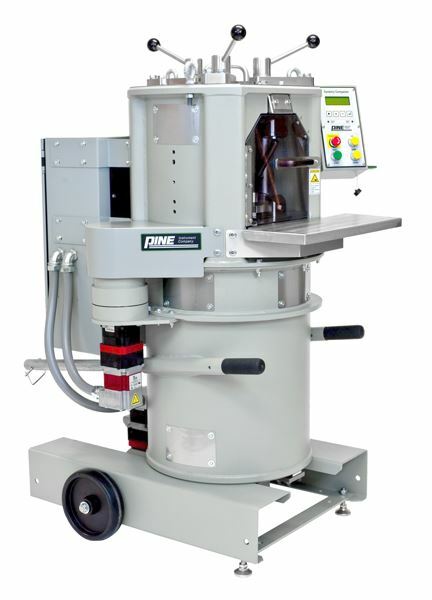 The HM-685S Superpave Gyratory Compactor w/Shear Measurement is an identical model, factory-equipped to measure and graph gyratory shear, the force required to gyrate the specimen. The data can be depicted as gyratory shear force vs. gyrations or as shear force vs. percent air-voids. This information provides insight into the workability and compactability of a mix. HMA-629 Specimen Cooling Door is for the HMA-685S models only and sold separately. Power requirements are 115V/50-60Hz for HM-685 or HM-685S, or 230V/50-60Hz for the HM-685F or HM-685SF. Inquire for other electrical configurations.